They say there’s no zealot like a convert. I had West Coast at 14th in my preview series last year (which is great news for Port fans this season, by the way). Halfway through the year, when they were 8-3 and sitting third on the ladder, I still wasn’t a believer. But watching them in the flesh at the MCG on a wintery June night was enough to convince me of their bona fide credentials. Only the very best sides can play in perfect cohesion out on the ground, and the Eagles did exactly that, and continued to do so all the way to the grand final. Cyril Rioli and a few others aside, Hawthorn weren’t great on grand final day, but they didn’t need to be. West Coast put in one of their worst performances of the year to go down by 46 points. Read the rest of Cam’s AFL season previews here. Did Hawthorn dismantle the ‘Weagles Web’ in a supreme feat of Clarkson coaching prowess? Was the Adam Simpson game-plan exposed on the large expanses of the MCG? Were West Coast overawed by the occasion? Maybe these things are true. History is written by the winners, after all. Or maybe the Eagles just had a bad day, which is just as likely a scenario. Let’s have a look at the side they might use to avenge last year’s grand final defeat. This is the final best 22 that I’ve put together in this preview series, and it was by far the most difficult of all 18 teams because of how hard it was to leave players out. For instance, my emergencies above played 45 matches between them last year, and all three played in that losing grand final. There are other experienced players like Mitch Brown, Patrick McGinnity, Jonathon Giles and Jamie Bennell not in the 25. The same goes for talented youth like Jackson Nelson, Tom Lamb, and new draftee Luke Partington, who has shown enough to get a contract extension already. The West Coast backline is extremely versatile and beautiful to the eye, both on paper and in action. They’re all equally at home defending one-on-one or intercept marking, led by Jeremy McGovern of course. As they proved last year, they can lose a tall from that line-up if they want to introduce more run. But even still, each player, tall or small, likes to take the game on when they get the chance. Shannon Hurn will set up play with what has been the most penetrating right foot in the league for almost a decade. Sharrod Wellingham is coming off arguably the best season of his career, but has had an interrupted pre-season, and isn’t fit to start from Rd 1. 2014 best-and-fairest Eric Mackenzie returns too, after missing last year with a knee injury. Will Schofield is the tall and Brad Sheppard the small, but both play a similar game down back. Schofield has been a known quantity as a consistent defender for a long time, but Sheppard reached new heights in 2015, a beneficiary of the re-jigged West Coast defence. The Eagles midfield is deep and a perfect blend of inside grunt and outside class, like all the best sides. They have 8-10 quality players running through there. There is plenty of outside run to take advantage of the Subiaco expanses. Andrew Gaff is the most unstoppable, far-roaming high possession wingman in the game, but we need to see him become more damaging in the forward half of the ground. 108 inside 50’s last year for 11 goals and eight goal assists is a poor return from Gaff. Compare that to Isaac Smith at Hawthorn, who had the same amount of inside 50’s, but with 23 goals and 14 goal assists. West Coast are at the point where they need to be challenging themselves against their Hawthorn counterparts. The bar has been set. Chris Masten goes all day but can let himself down with disposal. Dom Sheed has only been in the system for two years but is developing into a stylish player. The Eagles have taken a hit already, with Masten and Sheed already going to miss a decent chunk of the season to start the year, due to injury. Liam Duggan looked the goods in patches in his debut year, and will surely get a chance to stake his claim for a more permanent spot now. Lewis Jetta was added to the outside midfield mix over summer and should be able to pick up some of the slack from the missing Masten and Sheed, but whatever the opposite of starting like a house of fire is, that’s what we’d call his NAB Challenge form. Starting like an igloo melting perhaps. The inside work is led by 2014 Brownlow medallist Matt Priddis, and by now we know everything there is to know about his work. Contested possession? Yep. Clearances? Yep. Tackles? Yep. Brownlow medal votes? You betcha. Luke Shuey is one of the most explosive mids in the game, and it’s always a joy to see him bursting away from a stoppage in the middle of the ground, to either set up a goal or kick one himself. Can someone do the stats on how often he kicks the first goal of the game too? He seems to do it all the time. I’m sure there’s money to be made there. Elliott Yeo is one of the most complete young players in the game, and while last year was something of a coming out party in regards to his talent being properly appreciated, he was also a victim of his versatility in that he was never allowed to settle in one position. He should go to another level again. Of course, the most exciting inside player at West Coast is actually the ruckman, and who else could we be talking about but Nic Nat. There is no more devastating tap ruckman in the game, and his follow-up work with the ball on the ground is unmatched. Naitanui has been an All-Australian already in his career, but he has every chance to put together a career season this year. The West Coast forward-line kicked some big scores throughout 2015, led by Coleman medallist Josh Kennedy who was ever consistent on the way to 80 goals for the season. Jack Darling has been around for five years and 100 games now. In some ways it feels shorter than that, but then he often plays like it’s been twice as much. Some would say Mark LeCras is the most complete small forward in the competition, and if he’s not, there can only be one or two ahead of him. Everything about him is pure football, and whenever he pushes up the middle of the ground, good things are bound to happen. Jamie Cripps and Josh Hill apply the pressure, and finish off their work by hitting the scoreboard regularly. Cripps is a ferocious tackler and has innate goal sense, while Hill has more polish and craft. When you think of fellow contenders like Hawthorn with Rioli, Breust and Puopolo, and Freo with Walters, Ballantyne and Bennell, it underlines how important LeCras, Cripps and Hill are. The mechanics of Adam Simpson’s “web” will have been dissected by opposition clubs, and it will be intriguing to see if it is emulated elsewhere. In some ways though, the system is not quite as important as the buy-in and belief from the playing group. As Hawthorn has shown us, getting 18 players on the field, and 30-35 players in the club, being able to move and breathe as one unit is what is required to be successful. Think of all the best sides down the years, and you’ll know it to be true. 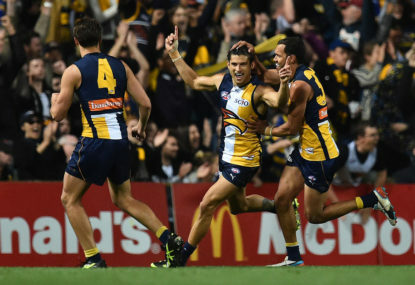 West Coast are as close to a top four lock as there should be, given their array of versatile talent, undeniable system and a fixture that, Western Derbies aside, shouldn’t see them seriously challenged at home until facing Hawthorn in Rd 22. They’ve got some percentage boosting games at Subiaco, and looking at their away games, they couldn’t end the home-and-away with any less than 15 wins. In 2015, the Eagles played some exceptional unified football, but failed badly on the biggest stage. In 2016, having gained from the experience, they’re the team to beat.